Willesborough Cemetery opened in 1884 and is maintained by Ashford Borough Council in Kent. Over the years much of the cemetery area has been used for graves and it has become necessary to make the last remaining unused area available for new burials. It was through excavating for new graves closest to the unused area, that the contractors working at the cemetery discovered the presence of Kentish Ragstone, a type of hard limestone which is used for building projects and is the only hard rock available at shallow depths in the South East of England. As such, the presence of this shallow bedrock would make any excavations for new graves very expensive and could seriously limit the capacity of the cemetery and decrease its projected lifespan, adding it to the list of closed cemeteries under the Council control. Ashford Borough Council approached GEOTEC Surveys Ltd to carry out a radar survey of the areas most affected and it was recommended that an Underground Mapping Survey would be completed using both Ground Probing Radar and Electrical Imaging. 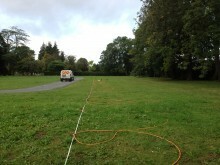 By measuring the changes in resistivity, the layers and boundaries of different electrical properties can be delineated & mapped and as such Electrical Imaging would help identify the depths and relevant layering and thickness of the rag stone, which would enable removal in places, to increase the capacity of the cemetery. The geophysical survey included the collection of Electrical Resistivity Tomography data obtained along four surveys lines and Ground Penetrating Radar sounding conducted along seven survey lines. A topographic survey of each scan line was completed in order for the results to be plotted on the accompanying ACAD drawing. "GEOTEC Surveys have provided the necessary information to help us manage this potential impasse, which we are pleased to say that is no longer a problem due to the results received. The results were well presented and easy to understand". The area surveyed on site was not yet being used for burials and covered a surface area of 1,100 square metres approximately. The pseudo sections produced by the resistivity survey, for which an example is included above, indicate that the limestone bedrock lies at depths between 2.5m in the southern and 3.7m in the northern part of the survey area. The GPR data obtained also confirms that the bedrock lies at depth greater than 2.2m within the survey area. This means that the ragstone is shallowest towards the internal road section, highlighted on the accompanying extract, but increases in depth the further we progress into the additional capacity of the cemetery space. As such the Council indicated that our survey results provided them with information as to where they could dig double depth graves, without hitting bedrock, which would decrease cemetery capacity, thus avoiding increased excavation costs.